"Lo-Melkhiin killed three hundred girls before he came to her village, looking for a wife. When she sees the dust cloud on the horizon, she knows he has arrived. She knows he will want the loveliest girl: her sister. She vows she will not let her be next. 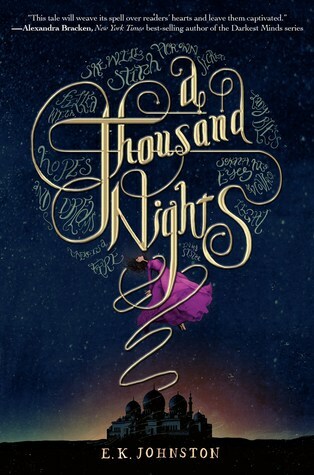 A Thousand Nights was filled with beautiful writing, an enchanting setting and bountiful dreams. I thought this book had such great promise, and thus I had high hopes, but unfortunately these hopes fell flat. I personally could not get past the slow building plot, once I figured out what the plot was, and the ending was a bit anticlimactic. I also wish I could have gotten to know the main character on a more personal level, other than just the constant stories she told of her upbringing and family. I did, however, enjoy the writing style as it took on a storytelling vibe quite similar to that of Neil Gaiman and Khaled Hosseini. I was in awe of the setting, as I envisioned an enchanting desert and oasis, filled with people of high faith and bustling tradition. In all, although I quite enjoyed the writing and it’s storytelling fluidity, I wish the plot was more developed and that there was some sense of suspense, thrill or mystery to drive the story. Based on the writing style, I would say I’d definitely be interested in reading more from the author, so long as I find the plot interesting.